Suffering from jet lag after a long flight from Vancouver ... I was up before 5am. Luckily for me my brother D was up too and gave in to my mad craving early in the morning . We found ourselves at Changi Airport Terminal 3 Ya Kun which is open 24 hours and I got my fix of local brekkie. 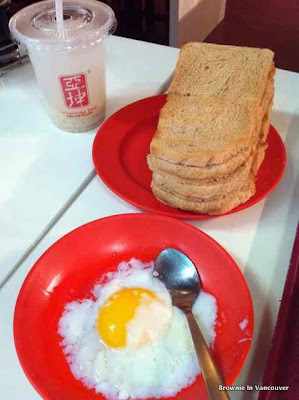 Who can resist kaya (pandan egg jam) and melting butter on toast with perfectly soft boiled eggs? If you like coffee, you should try the local coffee with condensed milk.